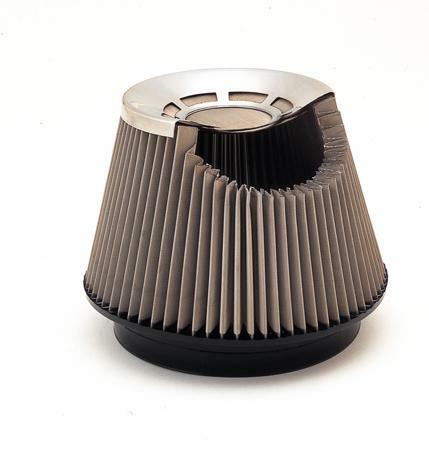 Blitz SUS Power Air Cleaner - Pann Auto Performance - San Diego largest aftermarket automotive performance parts - What do you drive? The BLITZ SUS Power air cleaners are made from top quality T-304 stainless steel. Totally unique, the entire filtration element is made from a fine stainless steel T-304 mesh (200 micron mesh and 150 micron crown). This mesh means the filter will never wear out, and have substantially less restriction than any other filter. Another feature is the super fine pattern of the mesh. This straightens the airflow and dramatically reduces aerodynamic tumble (restrictive turbulence). The BLITZ air cleaners also have fine mesh at the top of the filter, further improving the airflow capabilities. Unlike anything available in the market today, the BLITZ SUS Power air cleaner is by far the best performing and best looking automotive air filter money can buy, which include all the necessary pipe, brackets, and adapters. They are also available in four different universal cone sizes and various adapters, so they can be customized for almost any car.